Vincent Boylan (Joe Absolom) has just been arrested, suspected of being the man behind the brutal murder of seven girls, but the team only have a limited time to get a confession out of him. If they can't make him talk, he could slip through their fingers. Detective Matheson (Gareth David-Lloyd), who led the investigation, is sent in to try and get some answers. But things soon take a horrifying turn for the worse, as Matheson and his boss Lyndon (Tracy-Ann Oberman) are about to find out that all is not as it seems. You can find out more and watch the series, here. The episodes will be available for a short time after transmission. The winner of the the 2009 CWA Ellis Peters Historical Crime Award has been announced...it is...Philip Kerr's IF THE DEAD RISE NOT. I mentioned the Crocodile Tears by Anthony Horowitz giveaway the other day which is for US residents only, well I now have a competition for UK residents only. 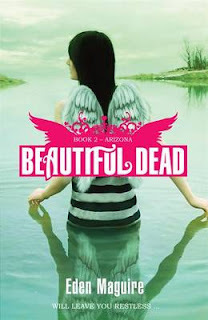 This time it's for Beautiful Dead: Arizona by Eden Maguire. Both books are by British authors, one is a spy/adventure book the other has a mystery to be solved (though there is a paranormal theme), and are aimed at teenage readers. I hope to have a competition soon for some adult crime fiction books. Details of how to win these books can be found on the Euro Crime competition page. From the New Releases page on the website, you can see what's coming up and also what's been published in 2008 and 2009 and also by different categories. I've had an email alerting me about a new publisher, Hersilia Press, which is focusing on Italian crime fiction. Their first book is Inspector Cataldo's Criminal Summer by Luigi Guicciardi which is the first in a ten (so far) book series and will be published in March 2010. In a quiet holiday town in the Italian Apennines, during a torrid summer, a string of gruesome deaths stirs up trouble in the local community: a suspected suicide which Inspector Cataldo is called in to investigate brings to the surface shady events belonging to the past, and a mysterious foreigner shakes up the delicate social balance of a group of friends who have a lot to hide. The Times is to become the media partner for Crimefest in 2010, and will again provide press coverage for the Crime Writers Association (CWA) Dagger awards. Crimefest is to take place from 20th—23rd May 2010, and the newspaper will carry a feature on the Bristol-based event in March. Following CrimeFest, the Times will also review the winners of its Sounds of Crime Awards for best abridged and unabridged crime audiobooks, sponsored by Audible. The convention will also host the announcement of the CWA Dagger shortlists, and on 22nd May, the Times will again cover the shortlists, with reviewer Marcel Berlins supplying a a round-up of his favourites from the CWA Dagger in the Library, International, Non-Fiction, Short Story, and Debut Daggers. On a related note, Euro Crime reviewer and Crime Scraps blogger, Norman, has now read all the Ellis Peters Award shortlist. Norman's thoughts on who he wants to win and who he thinks will win, can be found here. The official winner will be announced on Thursday night. 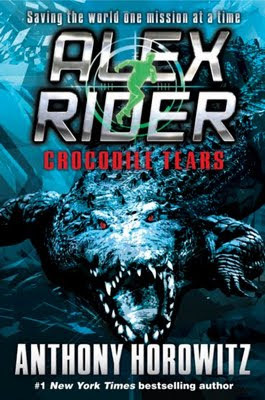 I'm running a short-term giveaway for 1 copy of the new Alex Rider novel, Crocodile Tears by Anthony Horowitz, over on my teenage fiction blog. The giveaway is open to US residents only and will close on 9 November. Details on how to enter the draw can be found here. and Norman Price reviews the Ellis Peters Award contender, The Interrogator by Andrew Williams. My companion to the Kingston Killers event the other night, Maxine, has been super efficient and written it up already, over on Petrona. The 9 attending authors were split into 3 groups: historical (Laura Wilson, Ariana Franklin, Nicola Upson), spooky (our categorisation!) (Johan Theorin, Yaba Badoe, Cathi Unsworth) and gritty (R J Ellory, Chris Carter, N J Cooper). Each author read a short passage from one of their books and then each set was cross-examined by Chris of Crimesquad. Most memorable answer came from Laura Wilson when asked why she wrote historicals..."none of that fannying about with mobile phones"
It was a great evening, well attended and I hope that Waterstone's at Kingston have future, similar events. The latest batch of CWA Dagger award winners was announced last night and International Dagger contender Johan Theorin won the CWA John Creasey (New Blood) Dagger for Echoes from the Dead. Read the whole coverage at the CWA page. Monte Carlo. A ruthless serial killer stalks the rich and famous. The victims are found horrifically mutilated. Each kill is announced on the city’s most popular radio show. ‘The voice on the radio. Manda Scott's The Crystal Skull is being reissued on 5 November as 2012 The Crystal Skull to capitalise on the release of the blockbuster film, 2012, on the 13 November. However they are two different beasts and the film is not based on the book, but apparently you can learn all about the prophecy about the end of the world from 2012 The Crystal Skull. The Crystal Skull has been reviewed twice on Euro Crime and Pat's review said that it is "a cracking story, with believable characters, a complicated plot, convincing historical details and a bit of mysticism thrown in" and Amanda's review opened with "The story is incredibly well researched and so powerful and captivating that its bitter-sweet ending has the potential to reduce you to floods of tears". There is a three minute trailer for 2012, here on YouTube (and it stars one of my favourite actors, John Cusack). and Michelle Peckham reviews The Mao Case by Qiu Xiaolong calling it a "a fascinating book". 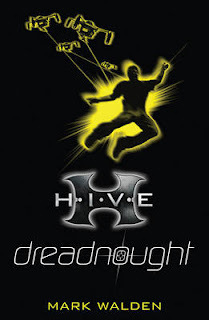 Last week I posted a review on my teenage blog of HIVE: Dreadnought by Mark Walden which came out in September. It's an exciting adventure yarn, a bit fantastical but should be enjoyed by fans of Alex Rider and the CHERUB series. The current issue of newbooks magazine arrived yesterday at work. There's quite a bit for the crime enthusiast this time with an article on Erdington Library Crime Reading Group (which I attend! ), plus extracts from Jo Nesbo's The Redeemer and Hans Falla's Alone in Berlin and a short piece by Jo Nesbo about his favourite table in a certain cafe. If you can get access to the magazine (local library?) then there are a limited number of free copies available of The Reedemer and Alone in Berlin (P &P is extra). Read more about the contents of the current issue and how to subscribe. When Omar Yussef travels to New York for a UN conference, he is eager to see his youngest son, Ala. But the discovery of a decapitated corpse in his son's empty apartment catapults him into a police enquiry full of contradictions. In his desperation to clear Ala's name, Omar's investigations place him at the heart of a deadly international conspiracy. The gruesome murder of a homeless teenage boy suggests a methodical serial killer is at work in Walvis Bay, a depressed port, isolated in the vast sweep of the Namib Desert. As part of a cross-border policing initiative, Dr Clare Hart is sent to profile the possible killer. She works with Captain Tamar Damases, an astute local detective, who heads up the coastal town's Sexual Violence and Murder Unit. Clare is glad to be distracted from the implosion of what was a blossoming love affair with Captain Riedwaan Faizal, who turned out to be more married than she thought. As Riedwaan joins Clare, to help with the investigation and to try to salvage their relationship, she realises that the harbour holds more than rusting Russian fishing trawlers. It's not just their relationship that is in danger, but their lives. A chilling, internationally acclaimed political thriller, Red April is a grand achievement in contemporary Latin American fiction, written by the youngest winner ever of the Alfaguara Prize—one of the most prestigious in the Spanish-speaking world—and translated from the Spanish by one of our most celebrated literary translators, Edith Grossman. It evokes Holy Week during a cruel, bloody, and terrifying time in Peru’s history, shocking for its corrosive mix of assassination, bribery, intrigue, torture, and enforced disappearance—a war between grim, ideologically-driven terrorism and morally bankrupt government counterinsurgency. Mother-haunted, wife-abandoned, literature-loving, quietly eccentric Felix Chacaltana Saldivar is a hapless, by-the-book, unambitious prosecutor living in Lima. Until now he has lived a life in which nothing exceptionally good or bad has ever happened to him. But, inexplicably, he has been put in charge of a bizarre and horrible murder investigation. As it unfolds by propulsive twists and turns—full of paradoxes and surprises—Saldivar is compelled to confront what happens to a man and a society when death becomes the only certainty in life. The return of Sandro Cellini: ex-cop and private detective (Florence). The Author Websites page now lists 796 sites. I've added new bibliographies for: David Barrie, Philip Baruth, Patti Battison, Belinda Bauer, Bryan Boswell, Gordon Brown, Raphael Cardetti, Jean Chapman, Charlie Charters, Neil Cross, Alex Crowe, Gary Dexter, Elizabeth J Duncan, Sam Eastland, Marjolijn Februari, Conor Fitzgerald, Harriet Hudson, Diane Janes, Rob Kitchin, Jens Lapidus, Valerie Laws, Simon Lelic, Carol McCleary, Ian McFadyen, Liam McIlvanney, Christian Moerk, Rita Monaldi & Francesco Sorti, Niamh O'Connor, Jessica Porter, Warren Roberts, Craig Robertson, Jarkko Sipila, Valerio Varesi and Jason Webster. I've updated the bibliographies (ie added new titles) for: Tom Bale, Simon Beaufort, Cara Black, Helen Black, S J Bolton, Rhys Bowen, Nick Brownlee, Bob Burke, Andrea Camilleri, C S Challinor, Kimberley Chambers, Lee Child, Alys Clare, Ann Cleeves, Barbara Cleverly, Martina Cole, John Connolly, JJ Connolly, Colin Cotterill, John Dean, Paul (PC) Doherty, Alex Dryden, Martin Edwards, Kate Ellis, Duncan Falconer, Elena Forbes, John Francome, Ariana Franklin, Juan Gomez-Jurado, J G Goodhind, Alex Gray, Susanna Gregory, Elly Griffiths, June Hampson, Cynthia Harrod-Eagles, Veronica Heley, Hazel Holt, Declan Hughes, Graham Hurley, Bill James, Peter James, Roderic Jeffries, Simon Kernick, Danny King, Alanna Knight, Bernard Knight, Tom Knox, Roberta Kray, Giles Kristian, Lynda La Plante, Stephen Leather, Donna Leon, John Macken, Shona Maclean, Keith McCarthy, Andy McDermott, Andy McNab, Sam Millar, G J Moffat, Donna Moore, Barbara Nadel, Jo Nesbo, John Niven, Charlie Owen, Henry Porter, Mary Reed & Eric Mayer, Phil Rickman, Michael Ridpath, Michael Robotham, Leigh Russell, Philip Sington, Alexander McCall Smith, Keith Souter, Sally Spencer, Frank Tallis, Brian Thompson, Sue Walker, Shirley Wells, Andrew Williams and Juli Zeh. Foxy was a bit low key yesterday - possibly something to do with the dead rat on the lawn (great) - and when he disappeared upstairs, I was expecting him to sleep on "his" bed. I got quite a start to see where he was sleeping... He managed to activate a few windows and tried to rename some folders but I think no lasting harm was done. and Norman Price reviews The Ignorance of Blood by Robert Wilson the final book in the Javier Falcon quartet. Yesterday I received the new catalogues for Corvus and Atlantic Books. 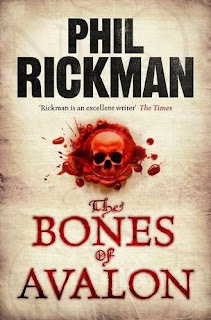 Religious strife, Glastonbury legends, the bones of King Arthur and the curse of the Tudors...can Renaissance man John Dee help the young Queen Elizabeth to avoid it? It is 1560. Elizabeth Tudor has been on the throne for a year, the date for her coronation having been chosen by her astrologer, Dr John Dee, at just 32 already famous throughout Europe as a mathematician and expert in the hidden arts. But neither Elizabeth nor Dee feel entirely secure. Both have known imprisonment for political reasons. The Queen is unpopular with both Roman Catholics and the new breed of puritanical protestant. Dee is regarded with suspicion in an era where the dividing line between science and sorcery is, at best, indistinct. And the assignment he's been given by the Queen's chief minister, Sir William Cecil, will blur it further: ride to the ruins of Glastonbury Abbey, bring back King Arthur's bones. The mission takes the mild, bookish Dee to the tangled roots of English magic and the Arthurian legacy so important to the Tudors. Into unexpected violence, spiritual darkness, the breathless stirring of first love...and the cold heart of a complex plot against Elizabeth. With him is his friend and former student, Robert Dudley, a risk-taker, a wild card...and possibly the Queen's secret lover. Dee is Elizabethan England's forgotten hero. A man for whom this world - even the rapidly-expanding world of the Renaissance - was never enough. Merrily Watkins will return in February 2011. Amid Iceland’s wild, volcanic landscape, rumours swirl about the secret sale of a long-lost ancient manuscript containing a saga about a ring of terrible power. The manuscript, guarded by one family for nearly eight centuries, was shown to J.R.R. Tolkein in the 1930s and was the spark that inspired The Lord of the Rings. That alone is enough to make the manuscript worth killing for...but what if, as some think, the ring exists too? Untangling murder from myth is Iceland-born, Boston-raised homicide detective Magnus Jonson. Seconded to the Icelandic police force for his own protection after he runs afoul of a drug cartel back in Boston, Magnus also has his own reasons for returning to the country of his birth for the first time in nearly two decades – to investigate the unsolved murder of his father. 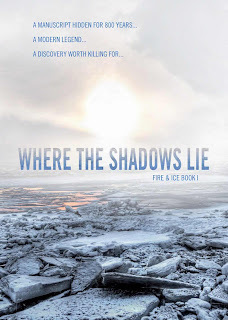 Binding Iceland’s landscape and history, secrets and superstitions in a strikingly original plot that will span several volumes, Where the Shadows Lie is a thrilling new series from an established master. The second book in the series is scheduled for June 2011. The Corvus catalogue can be viewed as a pdf file. The only one that sprung to my mind was In Matto's Realm by Friedrich Glauser which was published in 1936. You can find out more about why Holt created a functional family in Vik and Stubo and also why she hasn't been to the US in 8 years in this 6 minute interview - the questions are in Italian but the answers are in English. When Helen Barclay becomes the first female US president, the whole world takes notice. And unfortunately for President Barclay, one man takes very particular notice. He knows her dark secret, buried for over twenty years. And not only does he have the power to destroy everything she's worked for, but he also has the ultimate motive. Revenge. Unfortunately for the FBI and the Norwegian police, nobody knows about this when Helen Barclay chooses to visit Norway for her first state visit. But when she goes missing from a locked, heavily secured bedroom, they are forced - unwillingly - to work together to find her. Has she been kidnapped? Murdered? Can the US president really just disappear into thin air...? Taut, gripping and chillingly convincing, Death in Oslo is a brilliant new thriller from one of the world's most popular crime writers. A fourth Vik/Stubo novel (Pengemannen) was published this year in Norway but as yet the UK has not bought the translation rights. I was a bit dubious about the merits of Punishment (apa What is Mine?) but I was quite hooked by The Final Murder (apa What Never Happens) so I'm really looking forward to this one which is published 3 December. Curtis Brown chief executive Jonathan Lloyd has renewed the contract between thriller writer Gerald Seymour and Hodder, in a two-book deal that has bucked the trend for declining advances. Although Lloyd declined to specify a figure, he said Hodder had paid "more" than the original deal (which was also for two books). "My authors go up, not down," he said. "Gerald deserves it—the payment is commensurate with his abilities." Duckworth has bought the rights to the follow up book to the cult gangster novel-turned-film Layer Cake. JJ Connolly's new book is entitled Viva La Madness and follows the fortunes of Layer Cake's unnamed narrator. The story starts in South America where the last novel ended. Duckworth plans to publish in paperback original in spring 2011. "Viva La Madness is slick, gripping, complex, and hugely entertaining. JJ Connolly’s dialogue is unique – sharp, witty and even poetic – his characters are as compelling as they are horrifying, and he captures a certain seedy side of London with extraordinary vividness and authenticity. Fans of Layer Cake can look forward to a spectacular treat." Agatha's former husband James is engaged to be married to a beautiful, young woman and Agatha has been kindly invited to the wedding. To take her mind off this, Agatha decides she has fallen for Sylvan, a Frenchman she met at James' engagement party. To distract her still further she decides upon a holiday and flies to Istanbul, where unfortunately she bumps into James and his fiancee not once but twice - convincing him she is stalking them. So when the bride is murdered on her wedding day, naturally Agatha is Suspect Number One - but then matters are turned on their head when the dead bride's mother engages Agatha to take on the case of her murdered daughter! And very soon Agatha's own life is in danger while she tries to solve the mystery of the corpse bride while fighting off (halfheartedly) the advances of a very attractive and determined Frenchman. The Crime Writers Association is to introduce a "processing fee" across the majority of its awards from next year, and has cut the prize money on two of its prizes because they are not sponsored. But it has also dropped the £500 fee charged for shortlisted books. Murphy said: "We're a non-profit organisation. Personally, I’m not looking for any more [sponsorship]. Part of the problem we have had is the constant chasing. If we can rely on modest sums [from the processing fees] we can focus more sharply on getting good publicity and focusing on other aspects such as the social side for our members and informing them of current research." The Short Story Dagger and Gold Non-Fiction Dagger awards will both see their prize money dropped from 2010. The short story prize has been reduced from £1,500 to £500 and the non-fiction award has been halved from £2,000 to £1,000. Murphy said the short story prize had "not had sponsorship for years". The Gold Dagger for non-fiction has recently lost its sponsorship from Owatonna Media. The prize funds for the association's biggest prizes dropped last year after the withdrawal of Lawrie. The prize for the Gold Dagger dropped from £20,000 to £2,500, while the international Dagger prize fund dropped from £5,000 plus £1,000 for the translator to £1,000 plus £500. The CWA will begin charging processing fees of £15 per entry for the Gold Dagger, Ian Fleming Steel Dagger, Short Story, International and John Creasey (New Blood) Dagger. The biennial Gold Dagger for non-fiction will be exempt until its next cycle, which begins in June next year. The Dagger in the Library, sponsored by Random House, is also not affected. Rarely has a book been so anticipated in the crime fiction world: the return of Lisbeth Salander and Mikael Blomkvist in the final part of Stieg Larsson's Millennium trilogy. For my part, these books are to be savoured if at all possible and so I am extremely grateful that Maxine has taken up the challenge of the short deadline, (the book was embargoed until a few days before the publishing date), to read and review Millennium 3: The Girl Who Kicked the Hornets' Nest which was released on 1 October in the UK. The Independent asks: What was the secret of Stieg Larsson's extraordinary success? and there have been recent profiles in The Times and The Telegraph. The Times 1 and 2. So what does Maxine say about it..well, you can now read her review here. She has previously reviewed The Girl With the Dragon Tattoo and The Girl Who Played With Fire. Reg Keeland who has translated all three books, has his own blog here. Even though the series is sadly now finished, there are the films to look forward to and Maxine and I were not disappointed with the filmed version of The Girl With the Dragon Tattoo which we saw a few weeks ago. The FriendFeed News page has been updated with links to the recent reviews and interviews, most of them about Stieg Larsson. 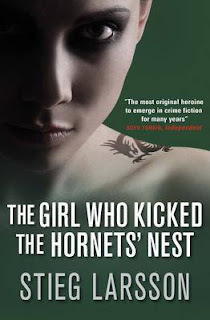 The Euro Crime (from Maxine) take on The Girl Who Kicked the Hornets' Nest will follow later today. Pan Macmillan has acquired two books in a historical mystery series from author Robin Blake. The series is set in Lancashire in the 1740s and features Coroner Titus Cragg and Dr Luke Fidelis. The first book is provisionally titled Awake in the Night, and sees Cragg & Fidelis investigating the death of the local squire’s wife. The book will be published in hardback in January 2011 and the sequel will follow in 2012.